Welcome to The Japanese Club in Howes Primary School! Howes Primary School has a Japanese club at lunch time. Children who are interested in Japanese culture enjoy it. 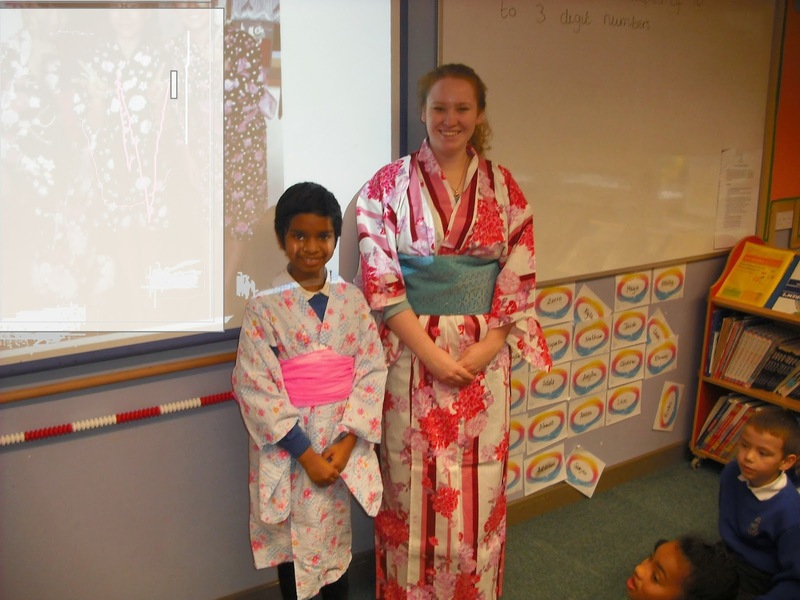 Children in year 4 found out similarities between the UK and Japan about traditional clothes. Traditional Japanese clothes is called Kimonos and traditional Scottish clothes is called the Kilt. The occasion of wearing traditional clothes are the same! Basically the culture between two countries- the UK and Japan- is completely different, so people seem to tend to look at the side of differences. However, every culture has some similarities, I would like children to find out similarities in culture to understand each other. At the end of the lesson, a teacher and a child in year 3 wore "Yukata" which is a casual kimono for summer! They look really beautiful, don't they? Children in H.I.U and some children in year 5 and 6 made gift bags for Christmas fair. They made beautiful stars with origami paper and put it on a plain paper bag. They converted a plain paper bag into a beautiful paper bag! It was the first time for children to make sushi rolls. They were really good at making! Let's play with Japanese toys! "A cup and ball" is called "Ken-Dama" in Japanese. Children in year 3 had a go to play with "Ken-Dama". The goal is to swing the ball into the air and catch it in a cup or on the pointed end of the stick. Children like challenges! They also tried other traditional Japanese toys such as " Ote-Dama" which means beans bags and "Kami-Fu-sen" which means paper balloons. It seemed challenging for children to use chopsticks. However They really loved to eat! Eating with fingers is easy though, it became a good experience for children to use chopsticks! Children in year 6 learned how to make a paper crane in Japanese lesson. So they started to challenge origami works by themselves. They made Christmas decorations with origami paper. they were quick to learn, although they struggled with it at first. They really enjoyed it! this is the website of origami club which children refer to.